Normally a second entry by an artist who was a pleasant surprise the first time out would be cause for heightened expectations, healthy optimism that the positives shown on their debut in this field would be improved upon while whatever slight deficiencies they’d had would be smoothed out by experience. If only it were that simple here. No, with this record we’re not worrying much about those things at all. Instead we’re worried if the artist we hear today will sound even remotely like the artist we met last time around. Far from being a case of modest advancement or slight regression what we’re concerned with is if he’ll even still qualify for inclusion in rock ‘n’ roll itself! There have been a number of cases where this same type of thing has occurred in rock’s first year and a half but in almost every instance it was with someone who was an older veteran of the music biz who’d long ago made their name in another field only to see opportunities there start to dry up over time. When that happened those artists were largely cast adrift until rock ‘n’ roll appeared in mid-1947 and offered the potential for career renewal. It wasn’t always the best fit musically for them, nor was it a sure bet for reviving their commercial appeal, but it was the best, if not last, chance they had in many cases before they’d have to turn in their microphone and union card and head back to the real world and look for a regular job as they neared middle age and so many of them took that chance and hoped for the best. Not so with today’s artist, for we’re talking about teenage vocalist L. C. Williams who by rights should be envisioning a long and successful future in his chosen style of music. Instead we’re wondering about the recent conversion he’s undergone after his start as a country blues prodigy of Lightnin’ Hopkins at his first stop on record with Gold Star as an 18 year old in 1948, to his sudden reinvention as an effective rocker with Freedom Records earlier this year, now a grand old man of 19. More pertinently we’re asking ourselves which version of Williams would we get this time around? The ancient sounding blues practitioner or the youthful sounding aspiring rock star? The fact this record is sitting here with a review for you to read today means he’s at least leaning towards the latter enough to make it back in the door, but beyond that we offer no promises. A lot has changed since that first release by L. C. Williams launched Freedom Records back in March. At the time nobody, not Williams, not the band, not the company’s owner Saul Kahl, knew what to expect out of their endeavor. What would be the response to that initial record? Who would be the audience most likely to check it out? Would it be blues fans Williams had already been courting elsewhere who might be expecting more of the same on a new label? If so, would this new direction Williams was now traveling in confuse that audience or would the growing rock community pick up the slack? Far from being just about L. C. Williams burgeoning career, this was also something Freedom Records themselves had to answer in regards to the label’s direction. Would they as a company be inclined to focus on the older, presumably more stable, field of the blues which in their home state of Texas was just as commercially viable as rock, or would they be geared towards trying to reach the rapidly growing national audience that rock was already pulling in? The answers to those questions came soon enough as the stellar Freedom Records house band led by sax player Conrad Johnson, proved they had what it took to excel in rock ‘n’ roll. When subsequently with the label’s other potential blues signee, Goree Carter, rejected their initial request to follow in the footsteps of blues star T-Bone Walker and instead plunged headlong into rock the company’s course was seemingly set for the land of rock ‘n’ roll and they didn’t look back. 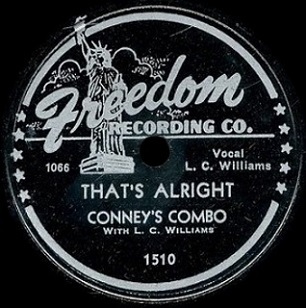 In the months to follow Carter and The Hep-Cats, as the studio band was dubbed now (after having the name Conney’s Combo for their work with Williams, which they reprise here for continuity’s sake apparently), had delivered a record that comprised the most exciting and hair-raising brand of rock this side of Big Jay McNeely, a futuristic sound that turned speakers to ashes and left no neutral observers in its wake. When the band itself got a chance to step out on their own under pianist Lonnie Lyons’ name last month they proved their worth to any lingering doubters who may have felt it was Carter’s guitar on steroids that had dragged them to the forefront of rock’s conga line. But now they were teaming up again with somebody in L. C. Williams who’d only had one release to his name that had ventured into rock ‘n’ roll and it was a slower more somber record at that. I Don’t Want Your Baby was completely within rock’s boundaries, make no mistake about it, but not something which was busting at the seams to prove it beyond any doubt. So for Round Two the question becomes just how much further would they take it, if at all? Would they scale back their ambitions any… would they allow Williams the chance to backtrack on what he’d shown vocally… and would the well of inspiration in aiming for a different audience than he’d been pursuing for over a year prior to this have dried up altogether? Or – (crossing fingers hopefully) – would That’s Alright have caught the rockin’ pneumonia and boogie woogie flu from the likes of Carter and attempt to match, if not out and out beat him at his own game? We won’t leave you in suspense, this is a step backwards in many ways… but at least it’s a fairly ambitious attempt at that. Thankfully the biggest fear – that of Williams returning to his Uncle Drew old man persona (for readers in the future that’s a 2018 reference to 26 year old basketball star Kyrie Irving playing an old man in a series of commercials that led to him starring in a movie as that character…) proves to be unfounded. Williams does NOT sound like an 80 year old man here as he had throughout much of his Gold Star tenure when he was all of 18 years of age when he was recording in the country blues idiom which requires you to sing as though you were born in the 1800’s. No, on That’s Alright he maintains a voice reasonably believable coming from a teenager. He’s spry and even rambunctious at times, complaining about how he’s treated by his girlfriend but still retaining a glint of confidence that things will turn around for him. The lyrics are pretty rudimentary and in fact at some points are clipped from other songs directly – swiping the vow “It’s your time now but it’ll be mine some sweet day” from Big Joe Turner for instance. As a result it’s like a montage of vacation photos… here’s a shot of you at the Grand Canyon, here’s one in New York City, another one at the beach…. you get the idea. They give you some sense of where you’ve been, but no insight in to what you did or felt while visiting those places. So it is with this song. All of this would be more easily overlooked if the mighty studio band of Freedom Records led by sax player Conrad Johnson and featuring musical reprobates of the highest order, had come up with something more focused to play behind him. Instead, like Williams himself, their work wanders all over the map, dropping musical quotes from “Here Comes The Bride” and veering from some reasonably intense horn work in the break, to bland and simple riffing behind him on the vocals. Where I suppose they deserve credit, at least conceptually, is in their attempts to let each member solo. And by each member I mean even those totally unsuited for it such as Nunu Pitts on bass. Now Pitts is a fine player but there’s a reason why you don’t hear many stand-up bass solos in any kind of music, let alone a style as raucous as rock ‘n’ roll. Plucking the strings of an acoustic instrument while the others sit that stretch out is a surefire way to inducing sleep among the audience, presuming their playback equipment in 1949 is advanced enough to even HEAR the distant thrum he creates. But then again that’s assuming you’d want to hear it in the first place. The unfortunate thing here is that for all of the missteps they might’ve made, most crucially heading back towards the styles of yesteryear that Williams had already shown an affinity for on Gold Star, they managed to deftly sidestep them all. So we’re glad to report That’s Alright is a song that fits comfortably within the rock boundaries in every way. Williams’s vocals are self-assured, his attitude is appropriate for this venture and even the band isn’t hampered by ill-fitting outdated instruments. But qualifying for rock’s playlist isn’t the same as attempting to DEFINE it and that’s where they all fall well short. There’s no evidence the band is attempting to knock you off your feet and overpower you with their playing as they were surely capable of doing. They may be trying to impress you with some cleverness, but rarely do you hear rock fans raving – “Damn, that was a clever track!” – when discussing their favorite records. More disheartening is the fact that this isn’t trying to push the envelope like labelmate Goree Carter had done. Aside from the fact it’s more uptempo than their first go-round with I Don’t Want Your Baby, they haven’t stepped up their game at all. There’s nothing here that could be called an improvement – lyrically, vocally, structurally or musically. That’s Alright reasonably suffices as a rock song but it’s hard to see Williams standing out in this field and thus no reason to suspect he’d stick with this brand of music for long after such a mediocre attempt. At least his country blues sides had some records which were well above average for that idiom, no matter how noncommercial that overall sound was becoming by the mid-way point of the 20th Century. Therefore it’d be entirely reasonable, even expected, for him to choose to remain a big fish in a smaller commercial pond of country blues rather than being a small fish in the bigger pond of rock ‘n’ roll where more aggressive fish like Carter would swallow him up. So if you were among those who wanted to see L. C. Williams keep plying his trade in rock ‘n’ roll, building a résumé with a succession of increasingly better records that showcased his diverse skill set and took advantage of the stellar band behind him, then this had to be something of a let-down for you as a listener, just as it must’ve been viewed a let-down by Williams and Freedom Records themselves. We all know what happens so often when that’s the case, particularly when both parties might be unconvinced of the commercial potential – and possibly even the musical merits – of something as relatively new as rock ‘n’ roll… that’s usually when they retreat to older, safer, environs for their next release. Since L. C. Williams already had a documented history in the sounds of the past, the rock fans whose hopes were slightly dashed by this underwhelming side following his fairly solid debut in the field now had to be downright panicked at what may await them the next time they saw an L. C. Williams release on Freedom Records staring out at them from the store window. Leave a reply on "L. C. Williams (Conney’s Combo): “That’s Alright”"
Copyright © 2017-2019 Spontaneous Lunacy. All rights reserved.